1 Jan: Happy New Year! We are now in the last month of 2006 visiting season. For those who need to get their fix of sun, sea and sand in Redang (or to simply escape the haze that's been blanketing Malaysia and Singapore the last couple of days caused by fires from land clearing in Sumatera), it's the last call of the season. Resorts should start closing from mid-October onwards. Note that there will be no resorts open on Redang this monsoon season. From dates that I've received, Berjaya will close 7 Nov to 7 Feb, Wisana will close 15 October while Laguna and Redang Beach will close 30 October. Note that Berjaya Resorts website URL has changed - the links in the Resorts and Links section have been updated with their new addresses. Berjaya Spa remains closed until further notice. For those who wish to plan their vacation early, the 2007 Malaysia and Singapore holiday schedule is now available in the Planning section. Visitors also have one more way to get to Redang in style - on board the cruise ship Superstar Virgo. I have added Star Cruise's Superstar Virgo Redang sailing schedule for 2007 in the Transport section. Last week, I had the opportunity to visit the MV Black Manta live on-board (LOB) dive boat at their open house - perhaps it should be more appropriately called 'open boat' - at Keppel Marina in Singapore. This was my first time setting foot on a LOB and I was quite impressed by what I saw. The air-con rooms were spacious and comfortable (even better than some of the budget resorts at Redang), the food was good and the boat itself was very comfortable with a nice lounge, wide roof deck and well-designed diver area. I had never considered going diving on a LOB for fear of getting seasick in rough seas but after seeing the Black Manta, it's certainly tempting. During the monsoon months, the Black Manta and her sister ship, the White Manta, will be plying the dive sites off the western coast of Thailand like the Similans and Surins. For those divers who can't wait for monsoon to end, check out their trip schedules on their website. With less than 2 months to go before end of visiting season 2006, we managed to squeeze in our annual family vacation at Redang from 1-4 September, taking advantage of Teacher's Day and the 1-week Singapore school break. This time, we simply tagged along with 5 other families on a chartered coach and it was good to let someone else do the organizing instead :). We had 4D/3N of perfect weather. For more details, read the Sep 2006 trip diary. Since my last trip in April, there hadn't been much changes. Ayu Mayang resort remained closed and I have no news whether they will be in operation next year. Further down the beach, the attractive Desagreen resort looks like it should be completed in time for visiting season 2007. Visitors to this website looking for latest updates should visit the Forum page. There's a lot of useful information, reviews and tips from others who have recently returned from Redang as well as contributions from local experts. If you don't find what you're looking for there, post your questions and see if other readers are able to help you with your enquiries. My deepest appreciation and thanks to all who have contributed useful information on the Forum. It was sad to learn about Crocodile Hunter Steve Irwin's untimely demise when we returned to Singapore from Redang. He had brought the message	of wildlife conservation to many people around the world through his unconventional, daredevil antics and infectious enthusiasm. The irony was that he was one of only a handful of people ever to be killed by a stingray - one	of the most docile and least aggressive	marine animals - rather than by a crocodile, dangerous shark or some other highly venomous creature. For reasons we will never know, the stingray must have felt sufficiently threatened	to act instinctively in self-defense and unluckily for Steve, plunged its barb fatally into his heart. Fact is, most marine creatures are non-aggressive and will only attack when provoked, cornered or threatened. The lesson here for the rest of us is to learn to have a healthy respect for marine life by not harassing or making them feel threatened in any way, and to give them plenty of room to maneuver and escape should they become uncomfortable in our presence. The other	lesson is not to be presumptuous and let our guard down when dealing with wild creatures that are usually docile and non-aggressive. They are wild and will act out of a powerful instinct to survive. There are many other TV wildlife conservationists that I enjoy watching like David Attenborough, Dr. Brady Barr, Jeff Corwin and Austin Stevens. Even though I did not always agree with his handling of animals, Steve Irwin was to me always the most entertaining, exciting and fun to watch. Goodbye Crocodile Hunter. After 3 weeks, the Sipadan 2006 diary has finally been completed. With so many pictures to share, I've split the Gallery section so that there is now a dedicated Sipadan gallery page. Recently, I happened to observe this website on a non-Cleartype display and found it didn't look	very readable. For those of you using Windows XP PCs with LCD monitors, turn on Cleartype to make text look a lot crisper and more readable. Cleartype only works with LCD monitors. To turn on Cleartype, right-click on the desktop and choose Properties to show the Display Properties dialog. Go to the 'Appearance' tab and click the 'Effects' button. Check the box that says 'Use the following method to smooth edges of screen fonts' and select 'Cleartype' as the method. It was upsetting and sad to hear just a few days after our return from Kapalai that a large barge was blown onto the shallow reef near Sipadan's drop-off jetty during a storm, destroying many of the beautiful shallow corals that lay between the drop-off jetty and Barracuda point. It's a mystery why the barge was even allowed near the island in the first place. Apparently the barge was bringing construction materials to build proper rest and toilet facilities for guests visiting the island. One might have thought this unnecessary if existing resort buildings and facilities were bought over and maintained when resorts vacated Sipadan. Answers and excuses aside, the fact is a proper wholesome approach to marine conservation must also include preventive measures, risk and contingency planning so that such man-made disasters are never allowed to happen. It may take many years for the affected part of the reef to recover and the only consolation for me was having the chance to see it one last time before this incident happened. It's currently June school holidays in Singapore and Malaysia and the resorts at Redang must be operating at peak capacity. It's probably the only time in the year when it appears there might be more snorkellers in the water than fishes, especially at the Marine Park Centre. The fishes probably look fatter than usual too at this time of year, with all the bread that visitors keep feeding them! For us, we'll try to avoid this mad rush season and plan a family trip sometime in September instead. If you're one of the hordes of visitors, stay safe and please remember to protect the corals. Kapalai resort (top) and pygmy seahorse. Just returned from my dive trip to Sipadan and Kapalai. This was my second visit to Sipadan but my first to Kapalai (previously stayed on Mabul). It was a memorable 5D/4N stay and after 15 dives among some of the world's best dive sites, I am still recovering from the overwhelming assault on the visual senses caused by the staggering variety and abundance of marine life - schools after schools of snappers, groupers, barracudas, jacks, redtooth triggers, bannerfish, batfish and of course, the famous Sipadan turtles everywhere all around us. As Sipadan overwhelms with sheer number and diversity, Kapalai, like Mabul, appears underwhelming at first glance until one starts noticing all the well-disguised and camouflaged marine life: scorpionfish, stonefish, crocodile fish, frogfish, mandarin fish and many other creatures that stay hidden and elusive. 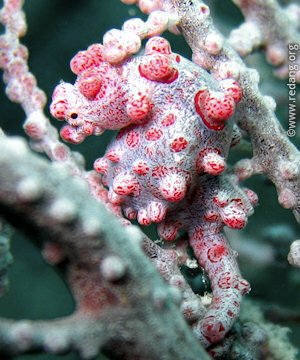 The biggest treat for me was seeing my very first pygmy seahorse, a mere 15mm tall, hidden among the branches of its coral fan. This rare and elusive creature is so well camouflaged that only 2 species have been discovered so far, the most recent in 2003. It was so small and blended so well with the coral fan that my Canon A95 simply could not auto focus on it and I had to resort to manual focus to get some shots. Kapalai Dive Resort was an attraction on its own. This beautiful resort is built on top of a submerged reef. With no beach or land, everything stands on clear water with corals and fishes swimming freely in water ranging from 1-10 feet in depth depending on the tide. The best description I can think of is a resort built on top of a giant marine aquarium except that the marine life isn't fixed - they can swim in and out of the 'aquarium' freely. From all the buildings and stilted walkways, one can see the usual coral fishes, cuttlefish, eels, bumphead parrotfish, barracudas, stingrays, needlefish, puffers and porcupine fish - all without even getting wet! We also experienced some of the worst storms at night in Kapalai when part of a typhoon that hit the Philippines moved south into the area. We had 3 nights of stormy weather, the last night in particular was the worst. Strong winds and rain caused the buildings to shake but the shallow reef prevented strong waves from reaching the resort. Fortunately, daytime diving was not affected and we had good daytime weather to enjoy all our dives. With over 500 photos, it'll take me a while to sort things out and write up the trip report. Stay tuned! This is a month of many long weekends (and busy periods for Redang) beginning with the Labour Day weekend (Monday 1 May), followed by Singapore polling day holiday for some folks only (Monday 8 May) and Wesak Day holiday (Friday 12 May). Interesting to note that the traffic to this site reflects closely the long weekends (especially Singapore holidays) when the number of site visitors drops dramatically as many presumably are away enjoying themselves in Redang or elsewhere. Not surprising as majority of site visitors (just over 40%) are from Singapore, followed next by Malaysia (25%). The site statistics also show a marked increase in interest in Redang beginning this year as daily visits have topped the 500+ visitor mark many times when it has seldom even broken the 400+ barrier in previous years. At this rate, the site will soon cross the 200K visitors mark. Hopefully that also means that more and more visitors are not just finding out useful information about Redang but more importantly receiving the important message about conservation and how to be responsible visitors. This week, I also received an interesting email from Derek and Quee, a semi-retired Singaporean couple living in Merang who enjoy the sea. They have a couple of boats and run snorkeling, canoeing, diving and sport fishing trips from Merang. For the record, I'm not a fan or supporter of sport fishing (or sport hunting) - I don't believe in inflicting unnecessary suffering on wildlife for sporting pleasure, but I respect the views of others who think otherwise. What's interesting is that Derek and Quee offer personalized boat charters. Guests can charter their boats for day-trips with customized itineraries, depending on your interest. These can include trips to Redang and other nearby less-frequented islands for snorkelling, canoeing, diving and other sea activities, complete with meals served on-board, or even lunch in Redang if you wish. Great for those who just have a day to spend or prefer to stay on the mainland at Merang and enjoy a day-trip to the islands. For more information, visit their website at Deutzia Nautical. 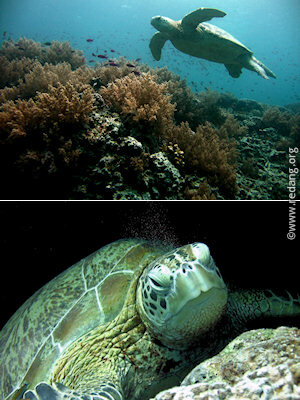 If all goes as planned, I'll be making my second dive trip to Sipadan next week from 9-14 May. As resorts on Sipadan have closed down to protect the island, I'll be staying at the nearby Kapalai Dive Resort on Kapalai island which co-incidentally was in the news yesterday when a Singaporean diver staying there died while diving in Sipadan. A sad reminder that although diving is a lot safer today than it was many years ago, it is still a technical sport that carries inherent risks. So divers (and others planning to take up diving) should always have a strong 'safety-first' attitude and mindset and not forget their training (and their buddies!). There is now strong coverage for mobile phone users of DIGI, Maxis and Celcom on Pasir Panjang and Teluk Kalong as the new transmission tower at Teluk Bakau is now fully operational. Redang Campsites and Chalet has closed and completely torn down since 4 April. Ayu Mayang remains closed for renovation and there is no information regarding when it might reopen. Desagreen Resort between Coral and Holiday is still under construction. The wooden jetty at northern Pasir Panjang beach near Tanjung Tengah has been removed - I think the scenery there looks a lot better without it. Finally met up with Khairil Anwar from Wisana Redang, a regular contributor to the Forum page. He introduced me to Redang Bay's coffeeshop which served quite good local and western food. Together with Redang Beach's Kopitiam and Summerpoint and Laguna's Food Court, there are now more choices of affordable local-style cooked food at Pasir Panjang. The 10 standard rooms at Laguna were better furnished than I'd expected and comes with TV, in-room safe, wardrobe, ceiling fan, air-con and ceramic flooring. Each room has 3 beds and provides comfortable, quiet and convenient accommodation especially for divers due to its location just next to the dive centre at Teluk Bakau. It is good to know that there has been a greater focus on conservation in Redang this year. Firstly, the reefballs that were deployed to form an artificial reef on a sandy bottom near Mak Cantik around mid-March have attracted many juvenile fishes seeking refuge within its protective walls. Only time will tell whether it will accomplish its primary objective, which is to attract coral larvae to settle and spawn coral colonies. Secondly, the Terengganu state authorities have just announced a ban on the use of flippers in a bid to protect corals especially in the coastal waters off Pulau Redang and Pulau Perhentian. The ban applies in coastal waters off all islands in the state but would not cover	divers. This is certainly welcome news as irresponsible snorkellers have been observed to step and trample on corals while wearing fins. Although a number of environmentally-conscious resorts have already stopped rental of fins to snorkellers, this directive from the relevant authorities should lead to a more consistent and uniform set of park rules and operational procedures being implemented, and hopefully enforced, across all resorts. At this stage it is still unclear whether divers are allowed to snorkel with fins, or whether snorkellers who own their own fins are allowed to use them. Stopping rental of fins to snorkellers will certainly minimize damage but even without fins, some irresponsible visitors have still been observed to step on corals while wearing booties, watershoes or even barefeet. Greater education and awareness will help to change some people's attitudes but at the end of the day, there will still be those who will only be deterred by strict enforcement and punishment. Perhaps a simpler way is to implement snorkelling zones in areas that are sufficiently deep so that contact with corals is not possible even during low-tide. On a related issue, I had the opportunity to witness and participate in a cleanup of a minor oil pollution at Chagar Hutang (Turtle Bay), where SEATRU run their turtle conservation projects which include in-situ incubation of turtle eggs laid on the beach. The coagulated oil had been washed up on the beach in small clumps, staining the sargassum weed black and dotting the tide line. It was probably caused by a passing ship discharging heavy engine oil into the sea during maintenance when they were in close proximity to the islands (apparently this practice is common in international waters). The effort to clean up the beach was far from trivial considering this was only a minor pollution. Even then, there is the possibility that it might pose problems for turtle hatchlings that come into contact with the sticky clumps when making their way across the beach to the sea. It's a reminder that for conservation to succeed, everyone must play their part. Years of conservation effort in one place can easily be threatened and set back many years by the consequences of just one single careless action within the general vicinity. Let us all strive to be responsible visitors to do our part in helping to protect the marine environment in Redang and other islands in the region. Please review press, THE STAR (Page:19) & NEW STRAIGHT TIMES (Page:22) for the news dated on 30 March 2006." For those who have booked packages with them, please contact them or the travel agent you booked with to find out more. It's only been 2 weeks since most resorts reopened their doors to visitors and already some visitors who've just returned are reporting good occupancy rates at some resorts. Others have had difficulty booking rooms during the peak periods and long weekends for the next few months. Looks like it's going to be another bumper year for visitor arrivals, one which we hope will see more responsible visitors who will help care for the marine environment there. Many corals in shallow areas have been destroyed by snorkellers stepping on them or kicking them, by pollution and other human-related causes. In an attempt to help the reefs to recover, 70 reefballs were planted in Redang waters a few days ago as part of a project by the Rotary Club of Kuala Terengganu with support from local resorts. Although the effectiveness of the reefballs have yet to be established (they depend on many factors like location, currents and the specific marine environment where they are planted), they are claimed to provide a base where coral larvae (planula) can settle and spawn new coral colonies while at the same time providing refuge for small juvenile fishes from predators. All of these conservation efforts would go to waste if visitors do not do their part to protect the marine environment in Redang from further deterioration. We would like to encourage all visitors to be responsible - please don't litter, don't step on or damage the corals and don't collect, catch or harass any marine life. Last month's water shortage affecting mainly the village and the Berjaya resorts, forcing them to close and reopen only on 1 March, was due to leaks in the pipe running from the mainland. It is not clear if the problem has been rectified though Berjaya's website (updated 14 Mar) seems to indicate that the resort is open for business as usual. Other resorts at Redang get their water from the ground and are not affected. Schedules for Berjaya Air have been updated in the Transport section. For 2006 visiting season, they operate 9 flights a week between KL and Redang (twice daily on Fridays and Sundays, once a day the rest of the week) and 4 flights a week between Singapore and Redang (Mon/Wed/Fri/Sun). If all goes well, I'll be making my first trip this year to Redang from 31 March to 3 April and hope to bring back more updates then. This will be a warm-up dive trip before a planned trip to Kapalai/Sipadan in early May. So far, all my coach trips to KT have been on Transnasional. This time, I'll be trying out Five Stars for a change. They cost quite a bit more than Transnasional (S$78 return) but they use more comfortable 26-seater VIP coaches (compared to 36-seater Transnasional coaches), drop off and pickup from Merang and go via the Second Link, avoiding the Causeway jams. The good thing is leaving later from Singapore at 10:30pm while the pickup from Merang back to Singapore is at 10am (just nice for visitors taking the 8-9am morning boats out of Redang). Made my first trip to Golden Mile Complex to book the tickets this afternoon and felt like I had stepped into Thailand - there were many shops selling Thai wares with signs in Thai, people speaking in Thai and plenty of authentic Thai eating places. Anyway, I found out that Enjoy Holiday Tour and Five Stars Tours operate their own coaches direct between Singapore and Shahbandar jetty/Merang jetty. VIP coach ticket prices range from about S$70 to S$90 return depending on travel season. Both also sell Redang holiday packages to many of the resorts at Redang. It's a convenient way to book your Redang package from Singapore though one ends up paying 10-20% more compared to a DIY package i.e. book a Transnasional/Enjoy/Five Stars coach from Singapore and book a Redang package directly with the resort or through local Malaysian travel operators like Ping Anchorage. It is good to see the new Redang Forum becoming more active after a slow start. Thanks to all who have contributed useful tips and feedback to fellow visitors. Effective today, only registered users are allowed to post new topics and replies. Unregistered guests may only read forum postings. This will help protect the forum from anonymous spam, adverts and other junk postings. Many resorts are now gearing up for opening season by offering promotional packages for early birds as shown above. Sounds like good deals. However, both Berjaya resorts are now closed until further notice due to "severe water supply shortage from the mainland to the island". With all the rain they've been getting this monsoon season, it's hard to understand why there's a water shortage. Guests who have booked should check the Berjaya websites for alternative options. It is not clear to what degree this water shortage affects the resorts at Pasir Panjang and Kalong as these resorts also make use of ground water. 2006 prices for most resorts can now be found in the Resorts section. Redang Campsite & Chalets will reopen their doors on 21 Feb. Their boats will leave from Shahbandar jetty in KT. It has been a wet January here in Singapore and Malaysia, a reminder that we are very much still in the midst of monsoon season. For the early birds who can't wait, Berjaya Redang opened 2 days ago and Laguna will open on 18 Feb with other resorts expected to reopen by 1 Mar. The newest kid on the block, Redang Bahtera will open its doors for the first time in 2006. Located in Teluk Bakau between Laguna and Redang Kalong Resort, it has 60 aircon rooms with bathroom attached and has diving facilities. I haven't been able to locate its website but it's already open for booking on Ping Anchorage's website. Prices seem competitive with other budget resorts. Wisana Beach Chalet at Teluk Kalong has also finally launched its website, or more accurately, the folks who own Wisana have launched their own travel website that not only sells packages to Wisana but also to other resorts and island destinations. With Chinese New Year round the corner, we'll be joining the hordes going up north as we visit family, friends and relatives in KL. To our Chinese visitors, here's wishing you a happy Chinese New Year and meaningful reunion with loved ones! 1 Jan 2006: Happy New Year! It's that time of year again for reflections and resolutions. As	we reflect on the past year, may we always be thankful for blessings big and small and for precious lessons learnt. As we look ahead, let us resolve to make a positive difference in the lives of others around us! Here's wishing all of you a very Happy New Year 2006! May your coming year be filled with peace, contentment, joy, hope and love! The new Redang Forum is now ready for testing and can be accessed by clicking on the forum link at the top of each page. The old forum hosted at VoyForums will continue to be available during this transition period until I've moved some of the more important forum postings over to the new site. Let me know if you have any problems accessing or posting to the new forum. With resorts on Redang closed for the monsoon, there's been little activity or updates on their websites. They should start opening between mid-February and early March for 2006 visiting season so I expect to have more updates by end of this month. (Note: Berjaya Beach will open on 24 Jan '06). In the meantime, use the 2006 holiday chart on this site to plan your 2006 visits.